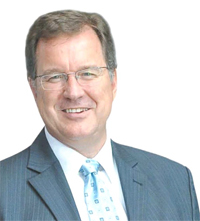 It is easy to forget what a rundown, tired business Sanlam was perceived to be when Johan van Zyl took over as CEO in 2003. Its share price had gone nowhere since its listing in November 1998 at 600c; its margins were among the lowest in the industry. Sanlam had a tradition of strong all-powerful bosses such as Fred du Plessis, who built a large industrial empire, and Marinus Daling, who drove the demutualisation and listing. In February 2002 Daling had died of cancer and there was significant strategic drift, not least because of the profound disagreements between the CE Leon Vermaak, a doctor in marketing, and the conservative board. Vermaak was eventually pushed out in December 2002. Van Zyl was a surprise choice as successor, even though he ran Santam, SA's leading short-term insurer and its most successful unit. Vermaak had also run Santam, so it seemed to be tempting fate to pick from there again. Van Zyl also had limited experience of running a business. He is an agricultural economist who worked at the World Bank and was principal of Pretoria University (admittedly an entity as complex as Sanlam with many of the same chal- lenges) before his two years at Santam. But as an outsider he had a different perspective on Sanlam when he took over in April 2003. "I believe Sanlam has always had excellent technical skills with some superb actuaries but it was light on businessmen," says Van Zyl. "There were 15 people in my original executive committee but only four of these looked after business units, the rest represented support functions such as IT, HR, facilities and marketing. "The businesses themselves got no airtime. My first executive committee meeting was entirely taken up by a debate on outsourcing the management of our sports club in Bellville. "In my first 100 days my goal was to get the focus back on business." He soon cut R400m from costs and reduced the corporate head office from 400 to 70 staff. Van Zyl made a point of giving more responsibility and autonomy to more business-minded executives such as Johan van der Merwe, CE of investments. "When I was at Santam I insisted that Sanlam appoint a proper businessman to run the investment business, which was in a mess. I took a big chunk of Santam's portfolio away from them." Van Zyl also identified Kobus Moller, then the number two in finance, as a rising star. He is now FD and was FD of Impala Platinum while still in his 30s (and at a time when Impala had a larger market capitalisation than Sanlam). 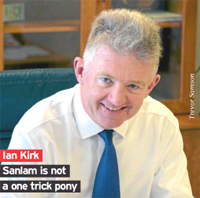 Van Zyl's proposed successor Ian Kirk has certainly proved himself as a businessman. He built Capital Alliance from almost nothing to R3,3bn when he sold it to Liberty in 2004. Dublin-born Kirk came to SA in 1981 on an exchange programme at his accounting firm Price Waterhouse. In 1983 he was transferred to New York, which he found hard to live in; he could not relate to a place that did not play rugby and cricket. He had no desire to leave accountancy until his clients Gary Berg and Larry Nestadt persuaded him to run a fledgling life business called AGA in 1996. Later that year it was acquired by Mzi Khumalo's Capital Alliance group. Kirk earned a reputation for acquiring life businesses and closed life books and integrating them onto the Capital Alliance platform. Businesses such as IGI, Stangen and AGF fell under the Capital Alliance umbrella. And the biggest prize of all was the large Fedsure and Norwich business which was integrated over three years. When Kirk approached then Liberty CE Myles Ruck to do the administration for his individual life business in 2004, Ruck decided rather to buy Capital Alliance. Kirk was appointed deputy CEO of Liberty but when Ruck retired Kirk was passed over in favour of Bruce Hemphill (now incoming CE of Old Mutual Plc). "Bruce was a career Standard Bank Group man, he was their guy, so it was time to move on," says Kirk, who was courted by a number of life businesses but chose to go to Sanlam as head of strategy, which included capital and special projects. "I didn't want to build up a department. In fact all I had was a shared PA in my base at Dunkeld, Johannesburg and another shared PA when I came to the head office in Bellville." By 2007 it was time to move back into line management and the sudden departure of Steffen Gilbert as CE of Santam gave Kirk his chance. Many people might have let Santam, then already a successful business, cruise on. But there were still challenges to resolve. Kirk closed the underperforming Santam Europe and built the Santam specialist business into a "mini Lloyd's", building up a string of underwriting agencies such as Stalker Hutchison Admiral in liability, Emerald in property and Mirabilis in engineering. "We adapted while others haven't." He also set up a reinsurer, Santam Re, and a direct insurer to compete with Outsurance called MiWay. "I was ready for another challenge after nearly eight years at Santam and I would have been happy to finish my career managing my own investments but I now have the opportunity to be CE of Sanlam. It will be different from the Santam job, not as operational as we have a decentralised structure. I will be supporting the business heads." Kirk says he demands a lot of himself and of the team but it has to be that way. He sees challenges, notably in the individual risk products. "It is nicely profitable but the market share isn't there. We are rolling out a new basis of life underwriting based on the body mass index and will continue with product enhancements." Kirk says Sanlam no longer has a onedimensional relationship with clients and as they become more affluent it can offer loans, short-term insurance and tax-free savings accounts. "We are not a one trick pony." He says Sanlam still has to prove that a quality financial services business can be built up in Africa. "Shoprite, MTN and SAB Miller have been a great success in Africa but I don't think any financial services business has built anything special yet." Kirk will certainly be inheriting a strong business. Sanlam's numbers keep looking healthier. M011er says the new business margins have increased from 2% to 3%, even though the gross margins on today's life products are far lower than those of the legacy products of the 1980s and 1990s. There has been a change in the mix of business which has helped — the entry level Sanlam Sky has a margin of 9,5% compared with 2,9% for middle-market individual life and 1,4% for Glacier. In the rest of Africa the margin is 7,6% (see graphic on page 20). Moller says the definitive event of Van Zyl's tenure was the sale of the 19% holding in Absa in 2005. This was the catalyst for restructuring the balance sheet and provided some spare change for acquisitions. "In 2004, 550/0 of our equity value came from our capital, with 24o/a from the value of the in-force life book and just 21% from our nonlife businesses," says Willer. "Now 26o/0 of our value can be ascribed to capital, 33o/0 to the value of in-force and 41% to our nonlife businesses. We have been able to extract lazy capital from the balance sheet." Sanlam sets a target of return on equity of the long bond rate plus 4%. Last year it outperformed this target by 5,7% even when market movements are excluded. Could these returns have been achieved if the Absa stake was still in place? Van Zyl's predecessor, Vermaak, was keen on a much closer relationship with Absa, perhaps even to take full control. Van Zyl concluded that it would be more profitable to sell the holding and either buy back shares or invest in new operations. "We looked for potential buyers and we eventually gave Absa management the choice between Standard Chartered and Barclays. And during the time of the sale the Absa share price increased from R40 to R82,50, which we considered a good price." Sanlam under Van Zyl has redeployed R30bn of capital, about half in share buybacks and special dividends and a quarter on investments in emerging markets, some in developed markets, where it owns investment businesses as well as its groundbreaking acquisition of African Life locally. Van Zyl says he is particularly proud that he changed Sanlam from an old economy to a new economy business. "Under the old dispensation with its all-powerful executive chairmen, managers were often appointed on the understanding that they would not make decisions. By old economy I mean a parent-child relationship, and a new economy is an adult-to-adult one. "The old Sanlam was characterised by a rigid hierarchy and rules, creativity was only encouraged at the top and there was a hero leader. In the new Sanlam, I like to think that everyone's contribution is valuable, all levels can be creative, there are high levels of transparency and leadership is a team activity." Sanlam uses what it calls a beehive survey to measure progress towards a highperformance culture. It scored less than half marks back in 2003, which put it in the poor class, but in the 2014 survey it scored 74%, putting it in the top class, though not quite world class. It scores particularly highly on talent creation, business disciplines and shareholder value. Van Zyl is also proud of the demographic change to Sanlam, which has gone from one third black employees to two thirds and he says even within the white portion about half are now English speakers, which reflects the diversification of Sanlam's client base. Sanlam was a middle-market business but it now has two important units at the top and bottom of the market. At the top end is Glacier, which in 2014 accounted for more than 90o/a or R18,3bn of the flows into the core Sanlam Personal Finance life insurance business. Glacier is a linked investment service provider, offering products such as investment-linked life annuities. In contrast, the traditional Sanlam individual life business had an outflow of R1,4bn. But though it is nice to have an upmarket platform business which is good for the brand, Glacier remains a relatively small contributor of R339m out of the cluster's gross operating profit of R4,8bn. Sanlam's personal loan business generated R308m. As an administration business, however, Glacier requires little capital. And Sanlam has been proactive at converting its retirement annuities into living annuities at Glacier. A business which demonstrates Sanlam's success at going upmarket to an even greater extent is Sanlam Private Wealth (SPW), part of the investment cluster. It originally took over private client businesses from Huysamer Stals, ABN Amro and Merrill Lynch and has been successful at converting execution-only clients into discretionary managed clients at higher fees, with R4bn converting to managed in 2014. It won the award as top SA wealth manager from Financial Mail Investors Monthly last year. SPW's operating profit increased by 20o/,,, to R226m in 2014. Individual life's huge book still spews out enormous profits which account for two-thirds of the cluster profit. Sanlam's exposure to the bottom end of the market came in 2005, when R2,5bn out of the R7bn net return from Absa was spent on African Life. This was one of the leading players in the mass market. African Life's main shareholder, Momentum, did not see a place for African Life in its portfolio as Momentum was a top end of the market player. But Sanlam had had little traction from its entry-level group schemes business — a market dominated by its crosstown rival Old Mutual. It needed to bulk up its entrylevel business. Sanlam Emerging Markets CE Heinie Werth oversaw the integration of African Life. "We kept up the brand and allowed it to operate separately for the first three years, which was the right decision. To try to integrate into Sanlam straightaway — as we had limited expertise in the entry-level market — would have been a mistake." The business, now called Sanlam Sky, runs neck and neck with Metropolitan as the second-largest player (after Old Mutual) in the market. It is a volatile business with 100/0 of the book originating in the platinum belt, where an unusually high number of policies lapsed during the strike. New business as a whole fell by 2o/a but because of the profits extracted from the existing life book earnings still increased by 25% to R949m. Sanlam still has room to grow in certain fields, notably health, which Van Zyl says should be a big source of income in the future. After an agreement with AfroCentric Healthcare Assets, Sanlam aims to acquire 28,7o/a of Medscheme, SA's third-largest medical aid administrator. It currently has just a small portfolio of medical aids. Van Zyl says Ian Kirk has a number of choices about his growth path: he can expand the emerging markets base as well as in niches at home and continue to drive operational efficiencies. It will be much tougher for Kirk to grow the businesses as there is little that needs to be turned around. But Kirk is a specialist in getting businesses to sweat.